Brookview, Waukee Elementary and Maple Grove Elementary Schools are taking great strides to prepare young leaders for the world of tomorrow through the Leader in Me program. The program helps students and staff form concrete ideas about leadership and encourages them to find their passions. Waukee Community School District (WCSD) believes everyone is a leader in his or her own way. Every child possesses leadership skills, but needs time to learn about how to be an effective leader and must be taught how to collaborate with other students and adults. “We aren’t trying to make just CEOs here. 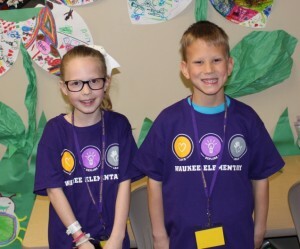 Every child has the opportunity to excel in the things they love and the ability to lead in different ways,” said Nicole Tjaden, principal at Waukee Elementary. Teachers also participate in the Leader in Me. Each teacher at Waukee Elementary has been to at least one local or national leadership symposium. Teachers are split up into action teams to focus on infusing leadership into modeling techniques, curriculum, instruction, environment, traditions and the overall school system. The idea is that all of the above elements should reflect the Seven Habits and leadership values. Brookview was recently recognized as a Leader in Me Lighthouse School. Lighthouse recognition is given to schools based on the results they are achieving and the positive impact that is being made on staff, students, parents and the greater community. There are roughly 110 Lighthouse Schools around the world and Brookview is the first Lighthouse School in the state of Iowa. Waukee Elementary is also working toward Lighthouse status. Each elementary school held a “Leadership Day” event in April to showcase student leadership skills with staff, parents and community members. 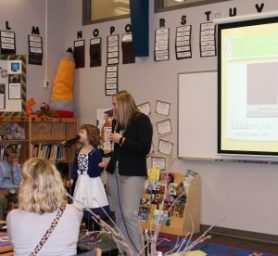 Brookview held their Leadership Day on April 8, Waukee Elementary on April 15 and Maple Grove will hold their Leadership Day on April 22. From left to right: Emma Twigg (third grade), Krish Sehgal (third grade), Payton Moore (third grade), Alexis Ripperger (third grade), Carson Kleppe (fourth grade), Lillian Severson (fourth grade) and Paige Pickering (fifth grade) waiting to talk to Iowa school administrators about the Seven Habits. Student Lighthouse Team members Finley Snavely (third grade) and Andrew Blackard (first grade) lead Iowa school administrators through hallways to demonstrate how leadership is built into the school’s environment. Third grade student Krish Sehgal explains the importance of Synergy to Iowa school administrators with an activity on working together.